Calling all poets and writers of all ages (especially young children and teens) and experience (including none!). 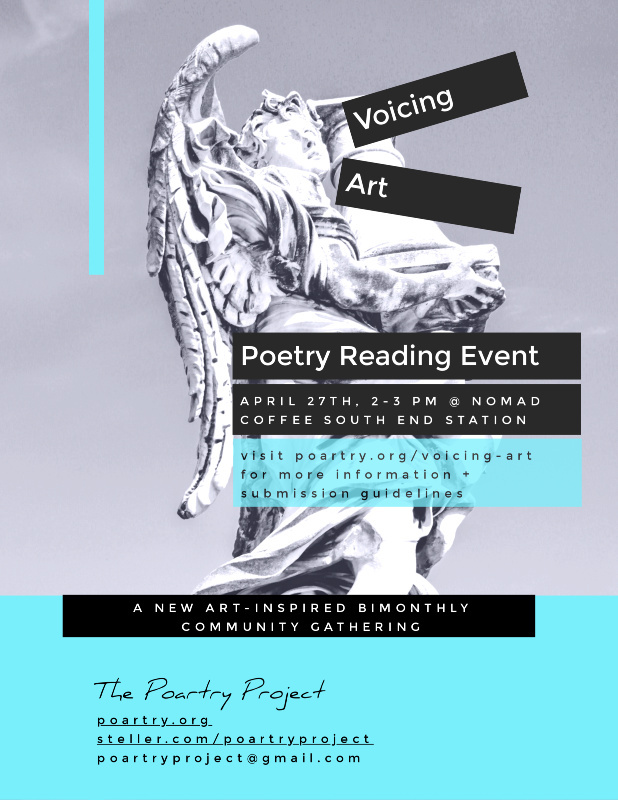 “Voicing Art” is a new art-inspired inclusive community poetry reading series hosted by The Poartry Project at Nomad Coffee South End Station. We host a reading with each new art exhibit at FLYNNDOG Gallery at South End Station. Poets and writers are invited to write and submit a 1-page original poem or prose piece inspired by the exhibit. Our first reading is Saturday, April 27th, 2-3 pm with food and drink available for purchase from Nomad. See poartry.org/voicing-art for details/submission guidelines. Submission deadline: April 11.